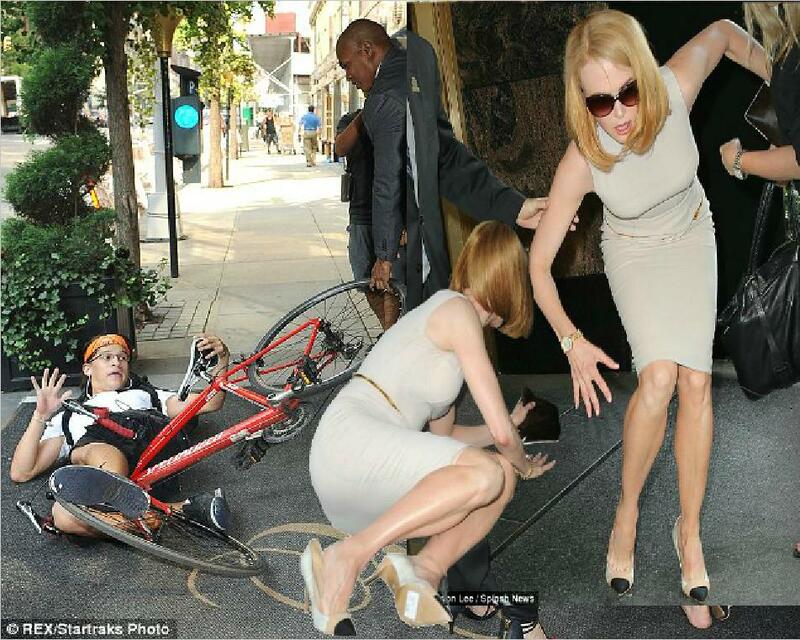 Nicole fell to the ground when she was hit by a photographer named Carl Wu, who was apparently racing to try and take a picture for her. Before the accident Nicole had been having a pleasant day viewing one of her favourite designer's Spring/Summer 2014 collection. While at the Calvin Klein show Nicole showed off a new bob haircut and her youthful complexion was clear as she wore minimal make-up aside from pink lipgloss. The actress was also highlighting her teeny tiny waist in a dress which was nipped in with a thin gold belt. The frock was dove grey, fell to Nicole’s knees and hugged her slender figure in all the right places. Nicole teamed it with three tone shows in white, brown and black hues, along with a gold watch and dazzling earrings. The Stoker star also carried a ponyskin clutch bag and wore large cat-eye sunglasses until she was inside Spring Studios where the show was taking place.